"Just like I'd buy in the stores! Makes a great garlic bread. Mixing it will give your arm a workout, so use a sturdy spoon!" Good recipe. Makes crunchy crust. I used a mixer and dough hook for mine. Don't over mix. Crunchy on the outside,soft on the inside. Flavor was a little bland first time around. Increased the salt with the second batch. Everyone enjoyed. Thanks. 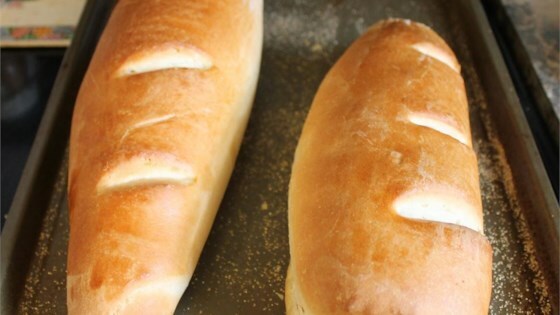 After spending 2 weeks in France and coming back home, I was dying for some good French bread...this recipe is great! Thank you! Bread is good but as a first time french bread maker I was lost without directions on what to do with the 2 cups of water.